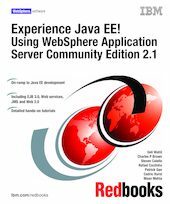 This IBM® Redbooks® publication is a hands-on guide to developing a comprehensive Java™ EE application using WebSphere® Application Server Community Edition v2.1 (WASCE), including core functions, security, Web services, and messaging. Novice users are thus able to experience Java EE, and advance from theoretical knowledge gained by reading introductory material to practical knowledge gained by implementing a real-life application. Before experiencing Java EE, you learn about the base specifications and intellectual knowledge of Java EE through brief descriptions of the theory and through links to other information sources. After experiencing J2EE, you explore advanced Java EE through previews of advanced topics and links to other information sources.